March 6th 2002 marks the centenary of the death of Prebendary William Poole, who was vicar of Hentland with Hoarwithy for 47 years between 1854 and 1901. 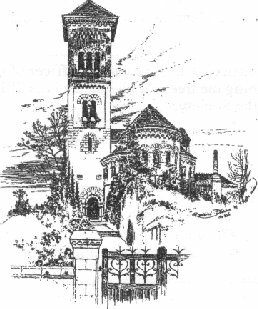 It was he who provided the funding, and the inspiration, for Hoarwithy's unique Italianate church. This was originally a plain chapel of the 1840s, which he 'beautified' from the 1870s onwards. He was born into a gentry family, whose seat was at the Homend in Stretton Grandison parish, and who owned considerable estates in the Borders and up in Yorkshire. It was the income from these estates that enabled Poole to build his remarkable church and to fill it with remarkable things. In his extensive travels in Europe he saw many buildings which would provide ideas for his church. His architect, John Pollard Seddon, had the versatility and sympathy - qualities not always present in Victorian Church architects - to give solid form to Poole's ideas. William Poole was a complex character, generous and diligent in his duties, but also intolerant and autocratic, especially in his later years. He controlled virtually everything that went on in his parish and there is no doubt that respect for him was mixed with fear. A Pink Publication on Prebendary Poole and his 'beautification' of Hoarwithy Church has been created and was published in his centenary year.